Did you know World Emoji Day is on 17/7? What a great day to have kids explore and create with emoji! 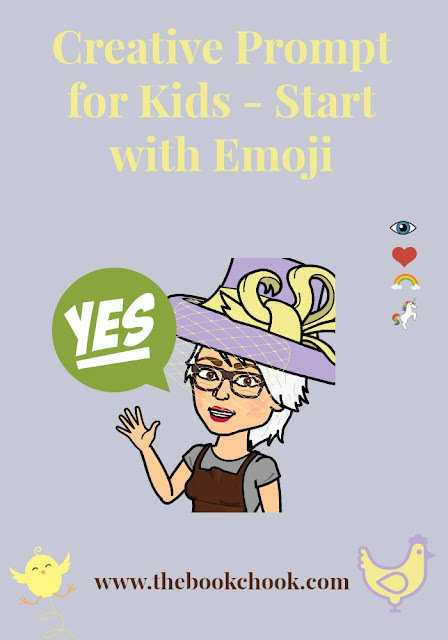 Emoji are ideal as prompts to creativity. They are visual, so it doesn’t matter what grade or reading ability a student has. The standard emoji available via a computer keyboard are finite, restricting kids and therefore almost forcing them to be creative, or to think outside the box. Most kids are familiar with emoji, and they’re fun. Here are prompts that might spark some kind of creativity in your kids. The choice of activity is up to them. I have made suggestions within prompts but the whole idea of a prompt is to start the creative process off. A complete change of direction is not just okay, it’s encouraged! *** Look at an emoji database. Here’s one at Emojipedia of all the Apple emoji, or all the Google emoji. Choose your favourite and bring it to life the way you choose. You might paint a picture of it, design a cake like it, write a poem or song about it, make it the main character in a video commercial or story, or create a puppet of it. *** What would your favourite emoji wear/like to eat/do? *** The RSPCE (Royal Society for the Prevention of Cruelty to Emoji) has discovered a terrible plot. The evil genius, Percival P. Plompenfleck, wants to remove all positive emoji and leave only negative ones. Which emoji do you think he would get rid of? Which emoji would Pompenfleck allow to remain? What do you think makes an emoji positive/negative? Could an emoji be both positive AND negative? Create a story about this. *** Translate a book or movie title using emoji, then give it to a friend to work out. *** Can you create an emoji of you? You could simply draw yourself, or try a different way. Here are some emoji created by Year 3 and 4 students with the Assembly app. *** Can you dress up as an emoji? What message does your emoji have for the world? How will you communicate that message? *** What new emoji would you like to see introduced? Poll your friends to choose the most popular new emoji suggestion, and then hold a design-an-emoji contest. ***With World Emoji Day taking place on 17 July how can we use emoji to celebrate? *** You and your friends are trying to steer clear of the Meanies. You want to send messages to each other but are worried that Beanie Meanie or Deanie Meanie might grab the note and read it. Can you and your friends use emojis and letters or other symbols to create a message you’d like to send? 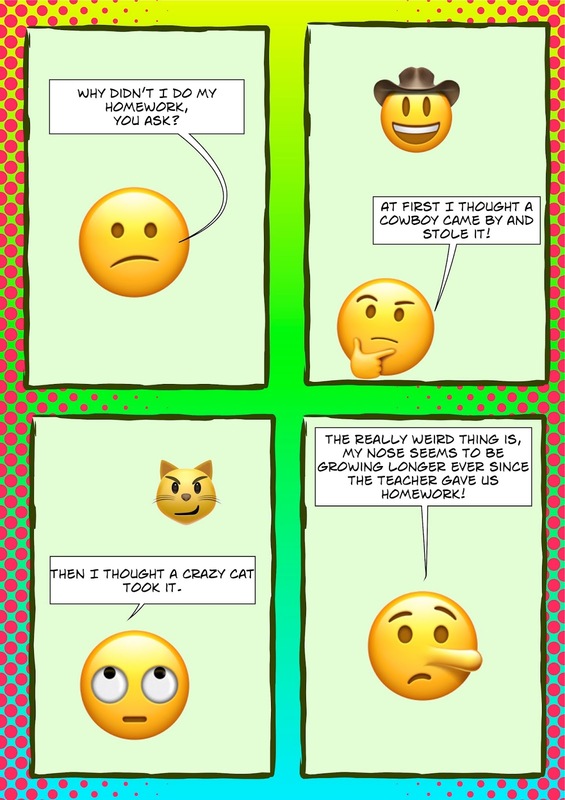 *** Create a comic with emoji as characters. 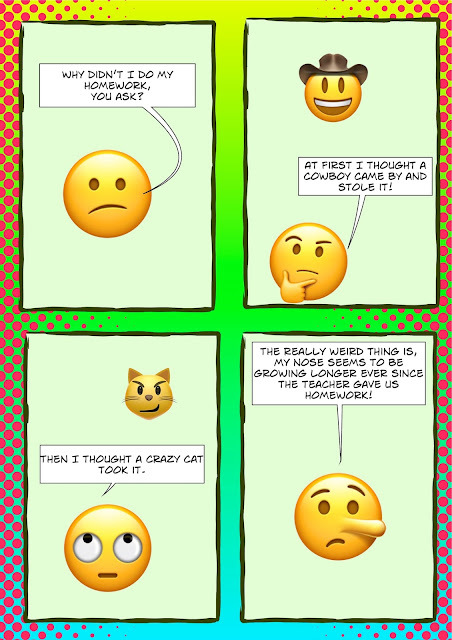 I made my example, above, by inserting an emoji into a text document, making sure I enlarged my font size to maximum, exporting it as a PDF, then as an image which I made transparent, then adding it to a blank canvas so I could add speech bubbles etc. I used Comic Life for this final part, but you could use PicMonkey or another image editing program. *** Invent an emoji-themed toy. You could try knitting or sewing one, use recycled materials to create a board game, even change sporting items to look like emoji. Or think up a much better idea yourself! If you’d like some more creative prompts for kids, check out the list embedded below.